The southern United States experienced widespread and heavy snowfall, sleet, and freezing rain on January 9 and 10, 2011. Six southern states declared states of emergency after widespread snowfall of 4-8 inches (10-20 cm). Thousands of flights were cancelled at Atlanta Hartsfield-Jackson International Airport, the world’s busiest. The combination of snow, freezing rain, and prolonged below freezing temperatures in Atlanta closed schools, government offices and many businesses for most of the week. The storm continued north along the East Coast and produced heavy snowfall in the northeast United States on January 12 and 13. The Moderate Resolution Imaging Spectroradiometer (MODIS) on NASA’s Aqua satellite captured this natural-color image on January 13, 2011. 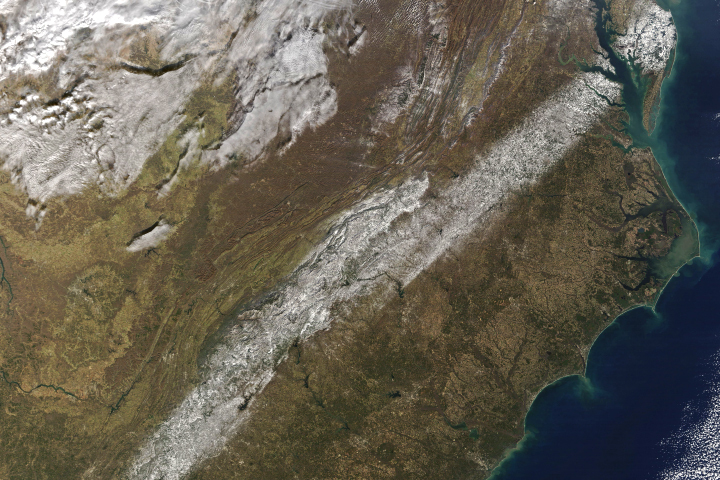 The swath of snow cover left by this storm stretched from northeastern Texas to the Carolinas. Brighter areas of snow cover are found in the Delta region of eastern Arkansas and northwestern Mississippi, which lacks the tree cover that is prevalent over most of the Southeast. In many other areas, trees protrude above the snow and appear darker to the satellite. The Arkansas and Mississippi Rivers are visible crossing the snow covered Delta. Another area of bright snow is evident in the Tennessee River Valley of north central Alabama, where some of the heaviest snowfall occurred. As much as 7 inches (18 cm) of snow remained near Huntsville, Alabama, on January 13. Two darker areas in northern Alabama are the Bankhead National Forest (south of the Tennessee River) and the heavily forested Cumberland Plateau (north of the river, extending into Tennessee). 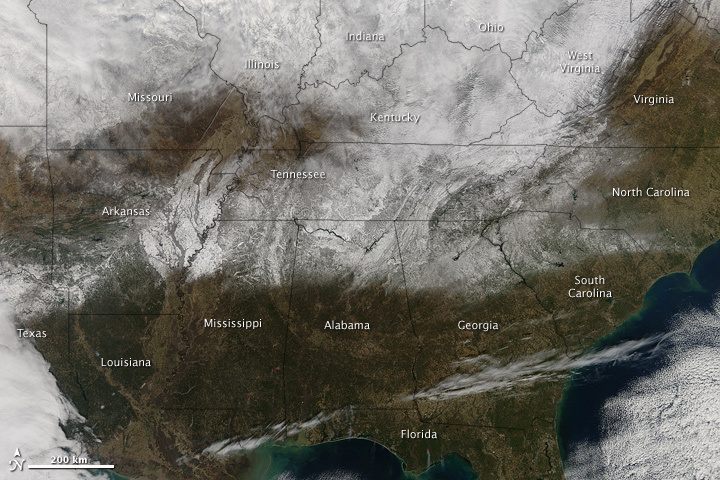 Low cloud cover appears over the snow in Tennessee, and high cirrus clouds are evident from Louisiana to southern Georgia. Cloud streets over the Gulf of Mexico (visible in the large image) were produced by low-level instability as the cold air in the wake of the storm passed over the warm waters of the gulf. NASA image courtesy Jeff Schmaltz, MODIS Rapid Response Team at NASA GSFC. Caption by Tom Mote, University of Georgia. 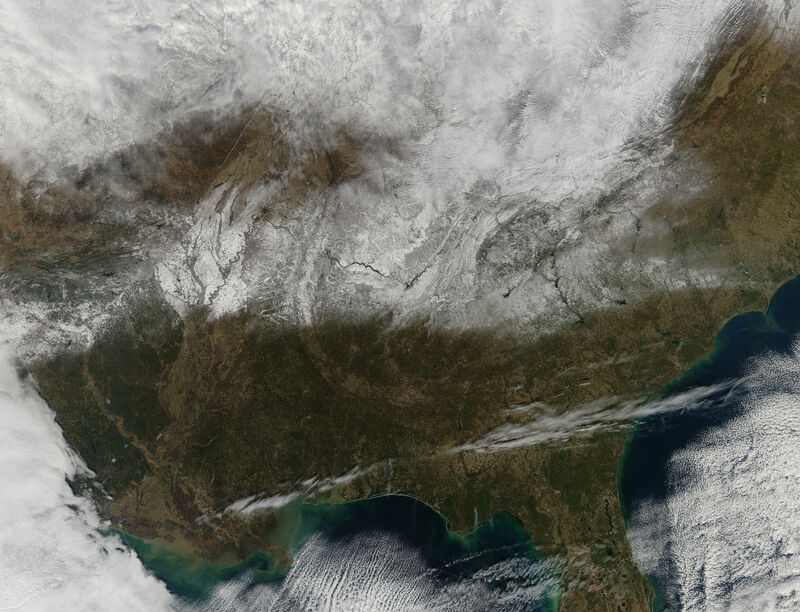 A swath of snow stretches from northeastern Texas to the Carolinas in this natural color image from January 13, 2011. 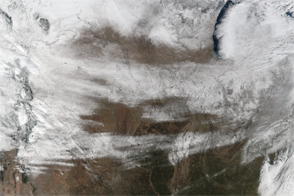 A winter storm brought rare snow and ice to states across the U.S. South between January 9 and January 11, 2011.